Teams had an early start Sunday morning as the semi-finals of the the Annual Cathy Kerr Memorial Spiel began at 8.30am at Ottawa's RA Club. Great Britain beat Chris Sobkowicz's Manitobans 6-3 and USA beat last year's Ontario champions Team Gregory 8-6. In the afternoon final it was USA over Great Britain 9-4, with Gregory claiming bronze with a 9-5 win over Sobkowicz. Great Britain had Michael McCreadie calling the game from 3rd with Aileen Nielsen throwing last rocks. Team USA rotated their fifth player, who then skipped the USA 2 side. In the recreation division Robert Michel was the winner and Aaron Wong-Sing was the runner-up. Both teams are from Ottawa. The results mean that Bruce Cameron, Ken Gregory and Chris Rees all qualify for the Ontario ParaSports Winter Games to be held in Kingston in January 2010. Richard Fraser will be the alternate. During the semis and finals, the other competitive teams curled for pride and experience so everyone had six games over the weekend. Labels: 2010 Team GB, 2010 Team USA, Bruce Cameron, Cathy Kerr Memorial bonspiel, chris rees, Chris Sobkowicz, Ken Gregory. In the other semi, Norway scored 4 in the final end for a come from behind victory over Sweden 8-6. Switzerland, with the highly experienced Manfred Bollinger at skip, fielded a team with just one change from the squad that struggled at the 2009 Worlds. In the final they overwhelmed Norway 7-1, allowing the single point in the final end. Canada redeemed themselves with a 4-1 win over Sweden to take 3rd place. (Q) There were a lot of blank ends. Was that intentional, to keep things clean? Wendy Morgan - "It was the game plan based on ice conditions." *Q) And how would you describe the ice conditions? Wendy Morgan - "Previous games heavy and inconsistent - the final game sheet 4 was the best sheet we played on during the event - the 3 blank ends were the result of outstanding execution by both teams in a defensive style of play." Morgan professed to being happy with the trip. "It was a terrific competition - we are very pleased with our results and moving forward to the new year." That's understandable coach-speak, but the trip demonstrated that Canada can not expect to have things all their own way. They lost to Finland in a game that did not matter, and to Switzerland in a game that did. No cause for panic, and Jim Armstrong's play will doubtless improve as he continues his recovery from injury and is able to put in the ice-time to reach the standard Canada will need in Vancouver. But Sweden, Switzerland and Great Britain have all won international events this year. Norway's play is improving ("We don't want to peak too early," says coach Christensen.) USA have a big event skip, while Korea threaten to break the rocks with their hitting game. It's going to be interesting in Vancouver. The four most experienced teams won through to Sunday's semi-finals at the 5th Annual Cathy Kerr Memorial Spiel in Ottawa. Great Britain beat Ken Gregory's Bradford team that represented Ontario at the 2009 Nationals 10-2 in today's 8.30am draw. USA had a tougher match, coming out ahead of Chris Sobkowicz's Manitobans 5-4. GB were back on the ice at 11am, this time posting a 10-3 win over USA II. Their third draw of the day was a 16-0 rout of the inexperienced London ON side. Manitoba had a 6-4 win over host Cameron, and a 6-5 win over Quebec, while USA beat Ottawa's Fraser 6-0 and finished with a 6-5 win over Cameron. Gregory beat previous Ontario champion Chris Rees' Toronta team 7-5 and finished the day with a 5-5 tie against USA II. Tomorrow's semi-finals are Gregory v. USA 1 and Great Britain v. Manitoba. Scores from today's games are below. 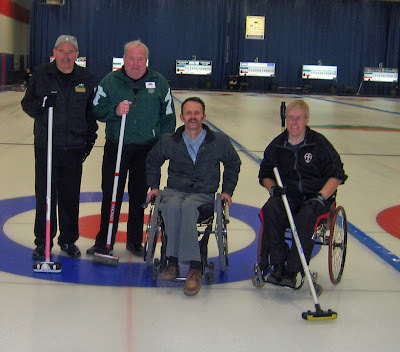 Bruce Cameron and the Capital Wheelchair Curling Club have assembled the largest competitive field outside of a national championships for the 5th Annual Cathy Kerr Memorial Spiel at the RA Curling Club in Ottawa this weekend. Ten teams, including Great Britain and two teams from the USA are competing against teams from Manitoba, Quebec and five Ontario teams. This is also a qualifying event to become one of the three teams that wlll attend the Ontario Winter ParaSports Games to be held in Kingston in January 2010. There is also a recreational division with four teams from the Capital Wheelchair urling Club and one team from Quebec. The opening draw of the 2009 Czech Open in Prague matched the 2009 Worlds finalists and Canada again scored 9 to win. Canada went out to an early 6-0 lead, taking 2 with the hammer and stealing 3 and 1 before Sweden got on the board with 2 before the half-time break. Whatever caoch Tomas Nordin told his team seemed to work as Sweden made the scoreboard more respectable with single steals in the 5th and 6th, but a 3 for Canada in the 7th brought the match to an early 9-4 conclusion. "Fast start, were slower the two ends after the break - ice was patchy and we changed our game to deal with the conditions," texted Team Leader Wendy Morgan. 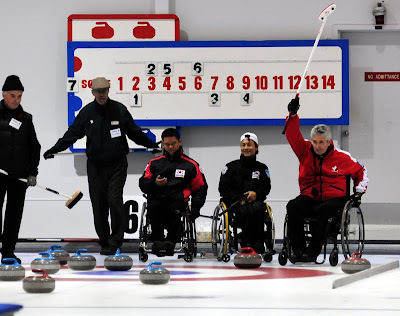 Before play, coaches approached the organizers and requested that the matches originally scheduled for 6 ends and 80 minutes, be extended to 8 ends with a bell at two hours, closer to the Paralympics format. In other games, Norway, whose coach told me prior to the tournament start that his team were on an upward trajectory but that he didn't want them to peak before Vancouver, had a steal of 4 against Switzerland but were only able to score in two of the seven ends played, losing 9-6. Germany overpowered Czech 2, opening with a 4 then stealing multiple points each of the next four ends, running out 13-2 winners. Finland, who have yet to appear on the World stage, tied 6-6 with Czech 1. Bruno Yizek, Canada's 5th, did not play. He will replace Sonja Gaudet at lead in tomorrow morning's draw against Finland. The PEI Curling Association is looking to expand its programs this season by attracting those who are either vision impaired, or use a wheelchair. A demonstration and workshop for interested participants, or volunteers who would like to coach and guide, is being held at the Crapaud Community Curling Club on Sunday December 6. It is hoped that representatives from all PEI curling clubs can attend these sessions. The wheelchair demonstration will be held from 10.00am-1.00pm. For more information contact Gayle Johnston at 902-368-1071. 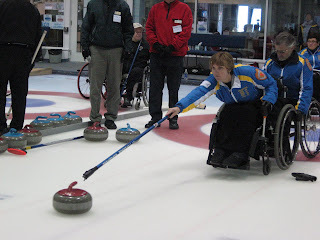 Crapaud Curling Club has been added to wheelchaircurling.com's list of wheelchair friendly clubs. If you know of any venues not listed, please send me an email with a link to the club's website, or a phone number and they will be added to the list. Canada skip Jim Armstrong is one of five Olympians and Paralympians Canada.com's North Shore News selects as "athletes you should know" in the run-up to the Games. Bob Cowan reports: British Curling had a media day yesterday at the Peak in Stirling, to give the press a chance to meet the GB Olympic and Paralympic curling squads. It was organised by Mike Haggerty (British Curling's media officer) and Katriona Bush (sportscotland's corporate media adviser), and the media interest in the curling squads was bigger than anything I have ever witnessed before. 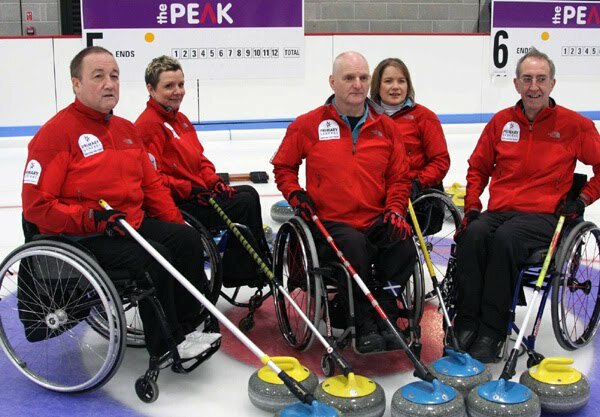 Of course Canada's wheelchair curling team is the only one finalised at the moment, but it would be nice to see a similar event held here after the Trials. 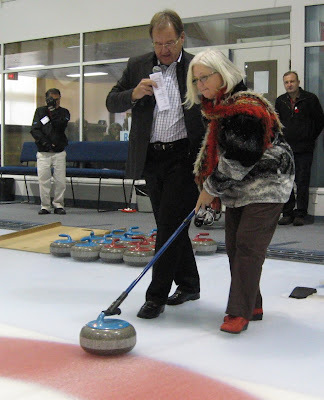 The 5th Annual Cathy Kerr Memorial Bonspiel will be held at the RA Curling Club in Ottawa this weekend, November 27 -29. There will be a competitive division of ten teams, including Team Great Britain, two USA teams, Team Manitoba, Team Quebec, Ken Gregory's 2009 Ontario champions, and four other Ontario teams. There will also be a recreational division, with four teams from the Capital WCC and one from Quebec. Canada had been scheduled to play, but decided that the competition offered at the Prague spiel the same weekend better suited their training needs. My 'Wheelchair Watch' column for the inaugural issue of Sweep d-Mag is available at the magazine's site and on wheelchaircurling.com, where there is an archive of published articles. Most of this month's column will be familiar to regular readers of the blog, but if you are a recent visitor it gives an overview of what has happened in wheelchair curling since last March. 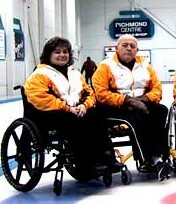 Canada fly out to Prague tomorrow (Tuesday November 24th) for the 4th Open Czech Wheelchair Curling Tournament 2009. It is an eight team field, with two pools for round robin play beginning Friday with a final on Sunday November 29th. Teams were seeded and placed in the pools according to their WCF Paralympics qualification points. Team Canada skip Jim Armstrong returned to the club displaying many of his achievements as an able-bodied curler, in an exhibition match against Paralympic contenders Japan. It was not a happy home-coming, as Team Canada lost 8-3. The ice was reported as extremely fast, and either Japan adjusted to the challenging conditions, or Canada found it hard to believe the broom. Either way, Jim had a tough game, short on a draw for an additional point in 3, short in the 6th to give up a steal of 1, and missing an open hit in 7 to give up 3. Since the employment of Chris Daw as Manager, the entire lower level of the Vancouver CC has been made wheelchair accessible. 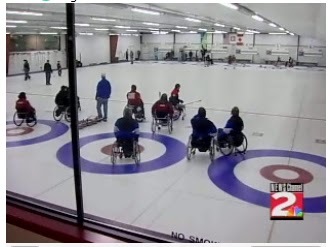 The club welcomes wheelchair users and will be hosting curling events n the new year aimed at disabled curlers inspired to try out the sport by the publicity surrounding the Paralympics. Team USA faced last last year's finalists Team Cameron from Ottawa in the 2009 US Open final at the Utica CC in New York. Skip Goose Perez executed a perfect hit and roll to the button with the last rock of the 8th end for a single point and a 5-4 win. USA II beat Bradford 8-7 to take bronze. News Channel 2 WKTV Utica NY had a short news report. 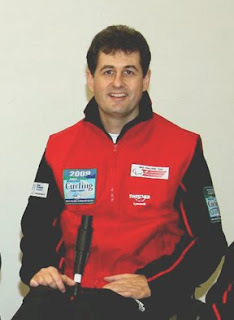 Team Great Britain skip Michael McCreadie is one of the world's most experienced wheelchair curlers, with decades of participation in other wheelchair sports. He feels that the time has come for the introduction of a two-tier classification that will force inclusion of more severely disabled wheelchair users onto teams competing under WCF rules. 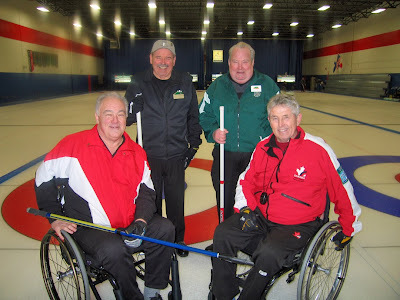 "The original rule is a real strength of wheelchair curling. The game was established for players who use a wheelchair for “daily mobility”. Players within the sport, in my view, wish that original ethos to be maintained and strengthened," he says in a discussion document being circulated prior to the WCF semi-annual meeting set for Aberdeen in December to discuss possible rule changes..
"I am aware," he continues, "that classification attempts to confirm player eligibility and then seeks to assign individual players to a sports specific class. I believe the time is right for Chief Classifier (Dr Andrew Burt) and other experienced classifiers to identify minimum disability criteria for our sport as opposed to classification on a player by player basis." He then proposes a radical change of rule regarding participation. Teams playing under WCF rules would be forced to include more severely disabled wheelchair users, the people at present being excluded from national teams focused solely on fielding the best athletes, rather than considering encouraging participation at all levels of disability. 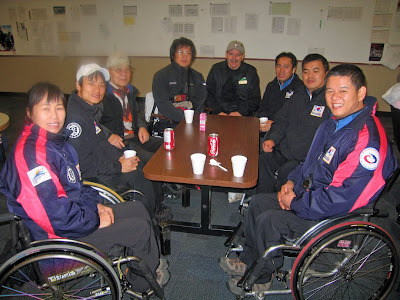 "Most teams currently comprise of the most able wheelchair curlers who use a wheelchair for daily mobility. 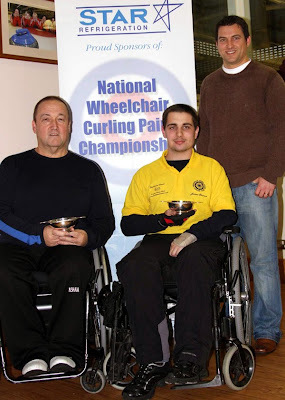 In the beginning there was the opportunity for more severely disabled players to compete for national team places. As the sport has developed across the world and the quality of play has improved, the most physically able players have started to dominate," McCreadie says. "In the absence of divisioning within the classification system tetraplegic players, players who use power wheelchairs and those with cerebral palsy will continue to be non competitive in the current open class system. I believe the time is right to introduce fairness into the sport along the lines of what currently exists in team boccie (teams comprise of at least one class 1 player). Each team should in the future include one player who qualifies for a class that is representative of more severely physically disabled players. It may be as simple as introducing two classes into the sport for all players who are eligible. Class 1 would be the open class for all eligible players. Class 2 would be for players who are tetraplegic, players who are in the advanced stages of MS, some players with cerebral palsy or players with severe upper limb weakness or limb loss etc. "I am not an expert in this area but I am certain that experienced classifiers could come up with appropriate profiles. In speaking to fellow national and international players I believe there is support for the introduction of a two tier system of classification that encourages, develops and retains the involvement of wheelchair players with more severe physical impairments while at the same time ensuring it retains its original aim of being a sport for non ambulant players only." 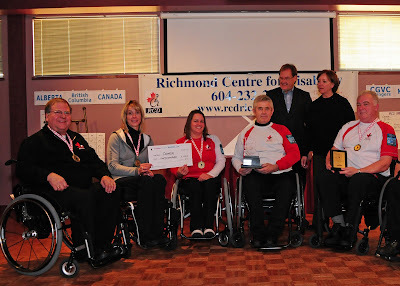 It is undeniable that where teams are selected by national associations seeking the best chance for a medal in return for their financial support, wheelchair curling has become a sport geared to the most athletic. Indeed, it was specifically mandated by Canada's "Own The Podium" program, a major funder, that the selectors choose the best available athletes, and then coach them to excellence. The question is whether that is bad for the sport, and if it is, does mandating inclusion of players of less physical strength serve a useful purpose? Michael thinks that it does. "It's all about participation, Eric," he told me when I expressed some scepticism about his solution. 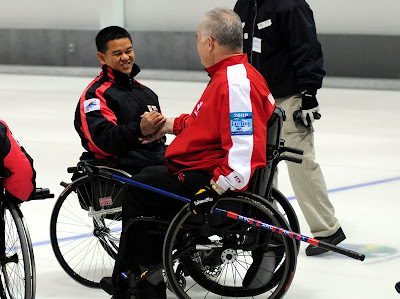 "We have to avoid the idea that unless you are some super-fit paraplegic or amputee, then it's not worth trying wheelchair curling because you have no chance of being selected for representational play." But even if one agrees that allowing coaches and selectors to exclude all but the best athletes is bad for the overall development of the sport, is creating artificial categories beyond stating minimum wheelchair usage requirements a plausible solution? It is worth noting that Germany's 2009 World Championship bronze medalists included a third, Marcus Sieger, who because of his level of disability would probably not have been considered for Canada, or Scotland, or Norway or for any of the teams centrally selected. He won his place because Team Germany were essentially a self-selected club side. Yet it would be hard to imagine that a physically stronger draftee would have performed more valuably. The actual proposal for changing eligibility, to be presented by WCF vice-President Kate Caithness at the December meeting, suggests expanding participation beyond users who require a wheelchair for daily mobility, to include anyone with (specified) significant ambulatory impairments who is unable to curl without using a wheelchair. My response to Michael's exclusion concerns would be to set a minimum wheelchair usage requirement and do away with central selection, which is the engine of exclusion, even at the cost of financial support for the favoured few. Allow teams to come together, and those with the ability and ambition will find the resources to fulfil their dreams. The present system makes athletes nationalistic totems, surrogates for the political ambitions of their associations or the careers of their coaches. So maybe selection wins your country a medal. A week later, who other than the athletes, their parents and their enablers, cares? You can read the full text of Michael's document, as written, as the first comment below. A response by Judy Mackenzie follows. USA 1 beat visiting Team Cameron 8-4 and Team Gregory 10-6 on the first day of the US Open in Utica, NY. Ken Gregory's Bradford ON team posted the one Canadian victory, a 9-4 win over USA II. In the remaining match USA II beat Ottawan Bruce Cameron's side 5-3. The four teams are playing a double round robin with a final Sunday November 22nd. Just four teams will be competing at the US Open this weekend at the Utica CC in upstate New York. Two USA teams, including the five players chosen to represent USA at the Paralympics, will face Team Gregory from Bradford ON and Team Cameron from Ottawa ON. USA II - Patrick McDonald (CA), Bob Prenoveau (NY), John Powell (TX), Dennis Williams. Tean Bradford - Ken (Mr. TV) Gregory, Katie Paialunga, Jim Primavera, Collinda Joseph. Team Ottawa - Bruce Cameron, Doug Morris, Jamie Eddy, Chrstine Lavallee. The format will be double round robin, with Draw 6 scheduled for Sunday morning, followed by the final. The small field is the result of a surfeit of November tournaments here and in Europe, forcing coaches (and funders) to choose which events to support. Great Britain, who have attended Utica in the past, this year decided to go to Ottawa's Cathy Kerr spiel the following weekend, and were not able to extend their trip to cover both events. Canada will be flying in the opposite direction, leaving next week for a tournament in Prague. 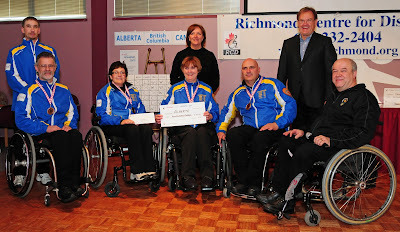 "This was done because we were at one time part of the Manitoba Wheelchair Sports Association. but in 2008 funding was deleted and we were on our own. "We have struggled but are now a going concern. As chairperson, I have just signed an affiliation agreement with the Manitoba Curling Association. Our mandate is twofold: to create a large base of wheelchair curlers who will take part in recreational curling to begin with and then hopefully curl competitively; and to continue the competitive aspect of the sport and foster a larger number of teams working towards this goal. "We are currently seeking sponsorship through grants and the corporate sector. it is my hope that we will be able to conduct four or five curling clinics throughout the province, and perhaps host a mid-west challenge for competitive curlers in the new year." Richard Dudek can be reached by email at this address. 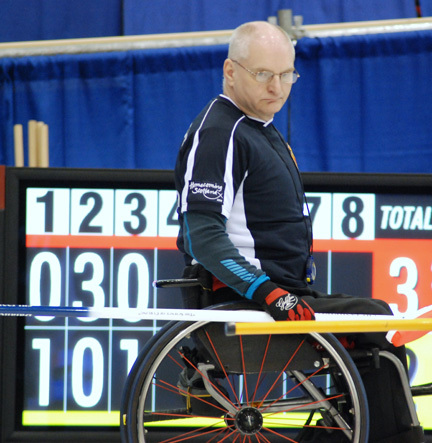 Manitoba's best known wheelchair curler is Chris Sobkowicz, who was the primary mover in starting wheelchair curling in the province. He then decided to concentrate on his involvement with Team Canada, and represented his country at the 2009 World Championships where he won a gold medal, though he did not make the 2010 Paralympic team. The 3rd annual '2 on 2' Golden Stick Open Bonspiel was held at the Golden Ears Winter Club in Maple Ridge BC this weekend. 18 teams took part, including 6 wheelchair pairs. The winner was Tim Gabert and partner, seen with Jim and Darryl, and Rich Green and Gary Cormack in the photos above. Tomas Nordin coached Sweden beat Norway 8-2 in the final draw of the 2009 Rolli Trophy, stealing seven points in four consecutive ends and finishing top of the table with an unbeaten record. Great Britain tied 4-4 with Bern I, fighting back with single steals in the final two ends to finish in second place. Bern I, led by the likely Swiss Paralympic team skip Manfred Bollinger, finished third. Conditions were challenging on the weekend, with heavy ice and very large swings. Results are HERE. Who's the guy in the wheelchair in the CCA's Start Curling television campaign? Hint: he skipped the 2009 Ontario Provincial Champions at the Canadian Nationals last March. Sweden (4-0-1) are the only unbeaten team after 5 draws at the end of the second day of play for the Rolli Trophy in Bern, Switzerland. They handed Great Britain (4-1) their first loss, 6-5, to head the table. Norway (2-1-2) lost to GB and drew with Bern I (2-1-2), while Germany (2-3) posted two easy wins after a shaky opening day. Results are HERE. The competition ends tomorrow after draws at 9 and 11.30am. Noted curling author Bob Weeks has a profile of Jim Armstrong in the Globe and Mail. It rehashes the same information that has been appearing in the mainstream media for several months now. Jim told me that he'd done the interview. "Bob Weeks is a good guy," he said. "I'll be disappointed if it turns out to be only about me." 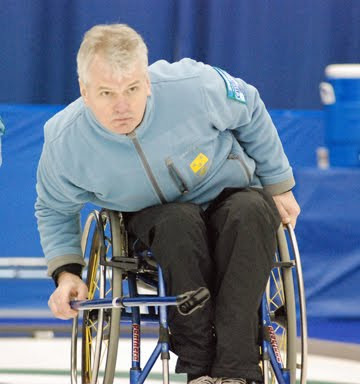 Jim has always emphasised two things abut his connection to wheelchair curling: that he's in it for the long haul, and it's not all about him. It's understandable that editor's look for the celebrity angle, but it's a missed opportunity when a curling writer makes no effort to look beyond personality. Germany's wheelchair curling team skipped by Jens Jäger was presented with the National Paralympic Team of the Year award in Berlin, beating out teams competing in basketball and volleyball. Germany won bronze at the 2009 Worlds, beating USA with a last stone redirection that, if you haven't already seen, is worth a view. Christine Steger has replaced Astrid Hoer on the team that will compete in Vancouver in 2010. Lyndon Little, writing in the Vancouver Sun, has an informative overview of the origins and the implementation of wheelchair curling, without mentioning that it is a sport for people requiring use of a wheelchair for their daily mobility. You can read it HERE. Twenty teams have registered for the stick bonspiel being held at the Golden Ears Winter Club in Maple Ridge, BC, this weekend. 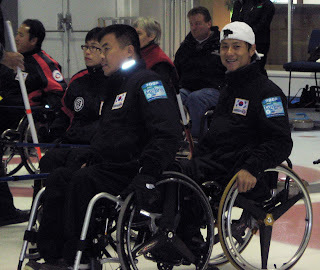 There will be three Korean teams playing as well as Jim Armstrong and Darryl Neighbour from Team Canada and several other local wheelchair curlers. Matches are 6 ends, with 6 rocks per end. All participants must use delivery sticks. Sweeping is allowed in front of the hogline. First draw is at 9qm Saturday and games continue through midday Sunday. "The shoulder's improving; slowly, but improving," Jim Armstrong told me this morning. "There was no question that it had to be repaired, and I was told that the rehab would take four to six months, but I didn't really buy into that. Now I am having to learn patience. We had a physio with us on our last trip and that helped and I am also doing the rehab exercises. I can push the chair. I just don't go up hills on my own. But everyone around me is being very supportive and my throwing shoulder is fine. "This team is a great group. No egos, everyone working hard and willing to learn. I've told them that I wouldn't trade any one of them for anyone that I have seen play. Bruno stepped up in Richmond when Darryl was sick, and played really well. He had a chance in Europe to play a couple of games away from home, get over the nerves that come with playing for Canada. He was ready to step in when we needed him in Richmond. It's tough being a fifth. You have to be prepared without being anxious that you're not on the ice. "I'm still adapting the way I call the game. The whole premise of calling without sweepers is very different. For a shot that you'd give a foot of ice for with competent sweeping, you might need two feet without that help, and then you probably add six inches because you don't want to risk scraping a guard. And that's if the throw's are accurate. "I believe that wheelchair curling is a hitting game and will become even more so. When people tell me it's a tap-back game I say maybe, but only on straight ice and I haven't seen any of that. Some teams will attempt to play in the centre to even the odds, and take their chances. "Korea can certainly hit and I was impressed by their technique. They'll be strong challengers in Vancouver. They just lack experience. As I tell Darryl, if there was an experience tablet you could take I'd have prescribed it already. I'm still on my own learning curve, keeping the game plan simple. When you put down the broom, and the rock's on the way, there's no help." The 2009 Rolli Trophy begins Friday, November 13 and features teams from Great Britain, Germany, Sweden and Norway as well as four domestic Swiss teams. Manfred Bollinger, who is expected to skip Switzerland's Paralympic team, will skip the Bern I side. Results should be available HERE. Norway won last year's tournament, beating Bern II, with Scotland finishing third. Canada's next game is an exhibition against Japan in Vancouver November 23rd, prior to flying to Prague for the 4th Annual Czech Open at the end of the month. The three most experienced teams, the only teams that had previously played together, shared the $2,000 purse on the final day of the Richmond International. The morning semi-final between Korea (4-1) and Alberta (2-3) did not see a repeat of Korea's narrow four ends apiece 7-5 round robin win. Korea posted steals of 3 in the second and seventh ends to ease to an 11-2 victory and a place in the afternoon final. The final began with Canada taking 2, but then, sitting 2, skip Armstrong's last rock was light, giving Korean skip Haksung Kim the opportunity to throw a six second double takeout that scored 3. Jim Armstrong hit back with a double takeout of his own to score 5 in the third. Canada then stole 2 when Korea, after a timeout, crashed a guard with their last rock. Korea fought back with one in the fifth and a steal of 2 in the sixth. In the seventh, Korea were lying 1 guarded when Armstrong tapped a Canadian stone back to displace shot stone and score 3, and the teams shook hands. The winners received $1,000, with $600 going to Korea and $400 to Alberta. Team Canada gave up a steal in the first end of the morning draw against Chris Daw's team, but then posted a series of big ends to come away 16-4 winners and finish the round robin 5-0. Darryl Neighbour sat out the game, still unwell after his flu shot. Bruno Yizek played 3rd. Korea finished with an 8-4 win over the Richmond hosts to claim second place at 4-1. Alberta beat BC 8-5. In the afternoon Page playoff, Canada held Korea to a single point, running out 10-1 wins and claiming the place in tomorrow afternoon's final. Third place Alberta beat Richmond 9-4 and face Korea in the morning semi-final. ThisWeek reporter Kevin Parks describes how the Columbus CC is hoping to attract wheelchair users and volunteers in football obsessed Ohio to come and try wheelchair curling at their two year old facility in the Clintonville area. 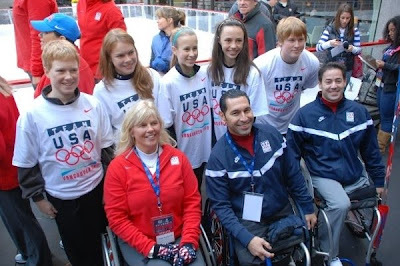 Club committee member Steve Shaffer wonders if someone attending the clinic might wind up representing Columbus as a member of the 2014 USA Paralympic Wheelchair Curling Team. "I'd love to see, as a start, just some participants," said Shaffer, who also is chairman of the club's building facilities and maintenance committee. "To have a team, that would be great." Experience in Canada tells us that it takes that one person detremined to make it happen, for a program to succeed. The give-it-a-go session will be held between 11 - 3pm on Saturday Novemver 14 and they hope to have members of the 2010 USA team present. Contact the club for more information. UPDATE: Here's a photo of the participants. Team USA 3rd Jim Pierce sits centre. Canada swept to another blowout score in a 16-3 win over hosts Richmond in the morning draw. Darryl Neighbour, unwell with a bad reaction to a flu shot, sat out the game and Bruno Yizek played 3rd. Alberta posted their first win, 10-0 over a Chris Daw-less CGVC Avengers team. Korea beat BC 8-7, their third win and the third time they have split the ends with their opponents. The marquee matchup came in Draw 4 with Canada edging Korea 6-5, taking a sngle with hammer in the 8th to win. Richmond beat Alberta 5-3 and BC beat the Avengers 10-4 in seven ends to round out the second day's play. Korea has brought the team that disappointed at the 2009 Worlds. With a 2-0 start they had much to be happy about. The Richmond Centre For Disability sponsored event began with piper Jamie Thompson leading out the teams and acting Mayor Linda Barnes throwing the ceremonial first rock. Then things got serious as Canada faced Alberta in the opening draw and crushed last year's winners 11-1 in just 6 of the scheduled 8 ends. Canada played alternate Bruno Yizek at lead in place of Sonja Gaudet who did not play in the morning draw. Alberta, without Bruno at 3rd, fielded the same team of Jack Smart, Anne Hibberd, Martin Purvis and Bridget Wilson that won silver at the 2009 Nationals. Korea began against the CGVC Avengers, skipped by Chris Daw, with Gary Cormack, Vince Miele and Corrine Jensen. It was a tight game with each team winning 4 ends. Korea fell behind early but ran out 8-6 winners with a steal of one in the 8th. The third morning game saw the Richmond host team of Rich Green, Jackie Roy, Tom Parker and Samantha Siu beat the BC Team 9-7 in an extra end. The BC team is skipped by Bob Macdonald, with Jim Miller and the alternates from Team Canada and Team Korea. In the afternoon, Canada beat BC 12 - 1, Korea again shared the ends but came out 7-5 victors over Alberta, and the Avengers doubled up Richmond 12 - 6. The format is a 5 draw round robin and page playoff, with draws at 9.30 and 1.30. The semi-final and final are this Saturday, November 7th. There will be a six team field at the Richmond International, with Team Canada, Korea, Alberta, Richmond hosts, Team Daw and a team of alternates. Reduced funding this year reduced the number of teams competing but there will be some fascinating match-ups. "Korea are technically awesome," Jim Armstrong tells me, "and Alberta look very confident." Chris Daw returns to the ice with Torino teammate Gary Cormack, and Vince Miele and the Island's Corrine Jensen. The Richmond Disability Centre's team has Rich Green, Jackie Roy, Tom Parker and Samantha Siu. Bruno will probably play lead for Team Canada in the first game against Alberta. The Toronto Cricket & Curling Club is hosting this Open format event at whiich wheelchair users can either play together or with regular curlers. The first games start at 10.30 with a dinner set for 5pm. I know there are blog readers who attend the Richmond BC Curling Club. If anyone would care to send me information on the International Bonspiel starting Wednesday, I'd be happy to make it available to everyone. Email me with a phone number and I will call you for updates. 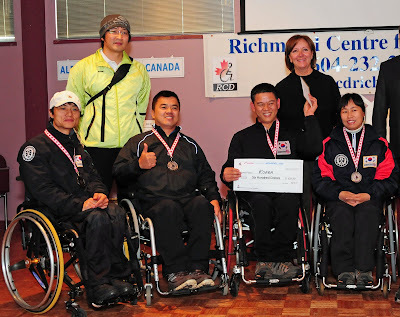 Richmond CC hosts Team Canada, Team Korea and Team Alberta as well as local teams in their 3rd Wheelchair International November 4-7th. Korea shocked everyone with their power-hitting style of play at the 2008 World Championships, where they finished 2nd to Norway. They failed to reproduce that form at the 2009 Worlds; a fact that their coach put down to general indiscipline in what was essentially a club side. It will be interesting to see whether they have regained their focus, and the ability to throw accurate 8 second takeouts. Chris Daw is blogging about life as a new BC resident, and managing the Vancouver CC, a post that will become even more challenging post-2010 when the club moves into the adjacent Olympic curling facility. You can read his blog HERE. The Vancouver CC are hosting a Canada versus Japan exhibition game November 23 at 1 pm. That may be west coast supporters' last chance to see Team Canada play before the Paralympics. 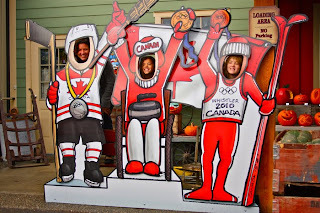 Maple Ridge's Golden Ears CC featured Ken and Keris, two wheelchair users on their home page. 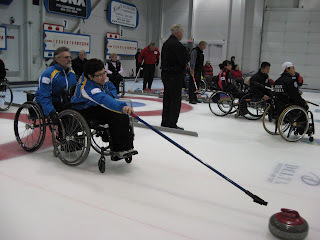 reminding their membership that wheelchair curlers integrate well into the regular game. The club had scheduled a 2 on 2 event November 14-15 with Korea and also Canada's Armstrong and Neighbour expected to take part. It's not on their calendar, so contact the club for details. Kelowna CC's planning for the 2010 Nationals is getting underway, headed by Gerry Austgarden and Donna Stuike. They'll be looking for plenty of volunteers. Contact the club if you'd like to help. The re-modeled and newly accessible club lounge and bar is spacious with lots of excellent viewing areas, so plan ahead for a March visit. Nineteen teams turned out for the 2009 Star Refrigeration Nationl Pairs Championship at Braehead, Scotland, this weekend. GB Paralympian Tom Killin partnered with James Brown to defeat Paralympic teammate Michael McCreadie and Russel Shanks 6-3 in the final. Full results are HERE and you can see lots of photos from the event at Bob Cowan's Skip Cottage Curling Blog. In Pairs play you rely on your opposition to brace your chair during delivery. It's worth noting that although all the members of the GB Paralympic squad played, they each paired with a less experienced curler.